I met Barry Ward several years ago when he was performing at the Wet Mountain Western Music Festival in Westcliffe Colorado. His talent and verse were immediately impacting. After recently losing a loved one, Barry’s song “My Blood is in This Land” was so touching – I decided to have it be a part of the moving memorial service. In the years since, I have caught Barry’s performances several more times and have been equally inspired by his songs. 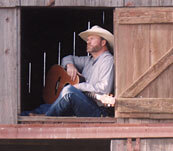 This entry was posted under My Family, Old West Memories & Stories, Western Music & Poets. You can follow any responses to this entry through the RSS 2.0 feed.